Impressed with the avalanche of content from this blog this week? Yeah, about that. It's a bye week, what can I say? But that's not stopping some good stuff being posted by some of my blogging colleagues. 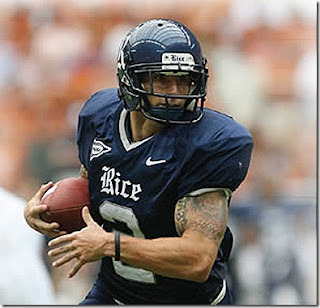 Greg at MVictors has a McGuffie update, including a picture of Sam that will also get you and a friend into the gun show. A man posing as a member of the color guard snuck into Michigan Stadium with two M16 assault rifles as the University of Michigan took on Michigan State Oct. 9 with more than 113,000 fans sitting in the stands, myFOXdetroit.com reported Thursday. "There wasn't anything that we believe was done incorrectly or improperly by police in any of the checkpoints there," said Diane Brown with the university's Department of Public Safety. U of M Police did clear the military man and allowed him into the stadium because when they checked his M16s they did not find any ammunition in the guns. They also did not find any ammunition on him, so they did not consider him a threat. He did not just get into the stadium. The man, who is a full-time member of the National Guard, made his way onto the field with his M16s. It was a member of the authorized color guard who noticed the man was not with them and reported the impostor to U of M Police. "Then we escorted him out. He was very compliant, and he just continued to explain that he wanted to come to the game, (but) couldn't get a hold of a ticket and thought he'd use his uniform to be able to do that," Brown said. So yeah, gonna be looking at that color guard a little closer in two weeks. Greg Dooley does some really great work over at his blog MVictors. We link to him often. He's widely considered one of the foremost experts, whether it's professionally or as a semi-pro amateur as he puts it, of UM football historians out there. 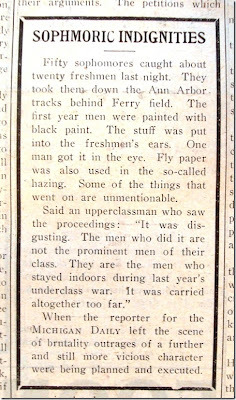 He did a very nice write up about the 1910 season as told by pages of the Michigan Daily. 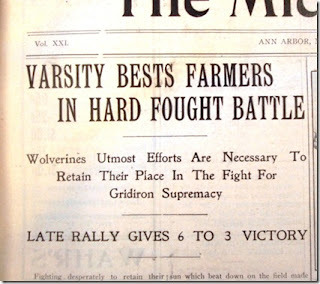 "Farmers" could be used to mean pretty much any Big Ten team, especially in 1910. 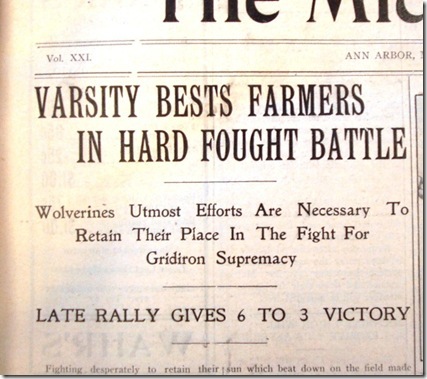 But in this case the farmers in question were the farmers from East Lansing. 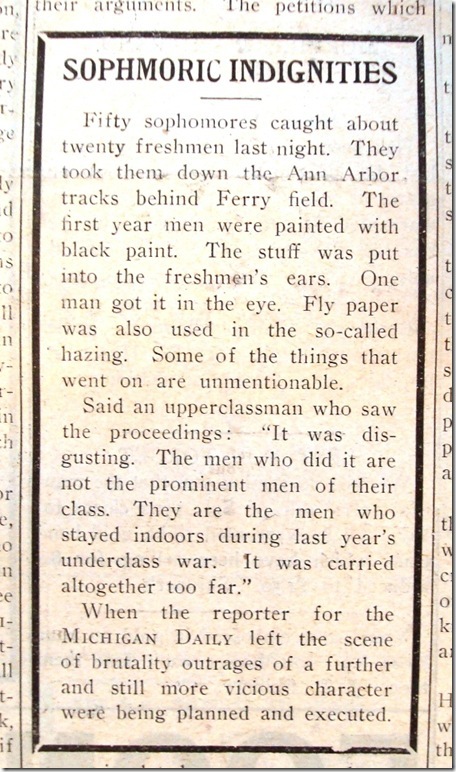 But the real gem of the story is the article regarding some sophomore-on-freshman hazing that took place that year. "The men who did it are not the prominent men of their class. They are men who stayed indoors during last year's underclass war." I love that line! Again, if you have an extra few minutes, I highly suggest clicking over to catch the rest of the story. Every week we participate in the Big Ten Bloggers Pick'em league hosted by Minnesota SBNation blog Daily Gopher. So far we're doing well. Usually by this point in the season I've locked myself firmly into the middle of the pack. But 2 weeks ago we took Illinois over Penn State and last week Wiscy over tOSU, which was a gamble and something I wouldn't normally have done, but it paid off. 6) Comments from coaches who are obliged to say that "this is a perfect time for our bye week". MZone is taking a huge gulp of the Oregon Kool-Aid after they dismantled UCLA last night 60-13.
mgoblog has its usual roundup of news, including a story from AnnArbor dot com that LB Kenny Demens and model-citizen Boubacar Cissocko are being sued for not paying rent to their apartment complex. And by "any" rent, I mean none. Demens was served with the suit Sept. 27, court papers filed this month say. He could not be reached for comment Thursday. Ah, boys will be boys. 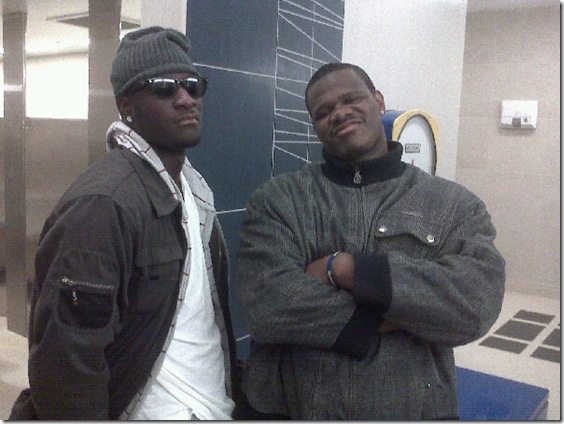 Speaking of which, Martell Webb tweeted a photo of himself and Devin Gardner that is all kinds of awesome. They all say that a bye week comes at the most perfect time for any team no matter which team it is and when it comes. And that's surely the case for Michigan this week. Not only are we recovering from a multitude of little injuries to a bunch of players such as Denard's shoulder and knee. Mike Martin and David Molk's sprained ankles. Fitzgerald Toussaint's...whatever hurts...you get the idea. I'd say every guy that plays each week probably plays with some sort of injury. 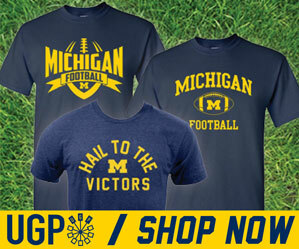 You just can't get 7 weeks into a Big Ten season without something wrong. The idea is being able to tolerate and mediate the pain. That's where a bye-week comes in so handy. It also comes in handy because it's a nice built-in excuse for a total lack of content, which hopefully I'm making up for on this huge end-of-week link-dump. Thanks for your understanding.